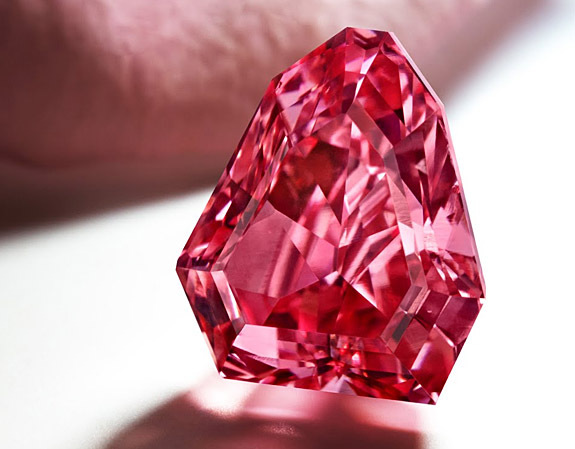 Four ultra-rare fancy red diamonds are among the 65 diamonds in the 2015 edition of the Argyle Pink Diamonds Tender, an annual presentation by mining company Rio Tinto. A world exclusive preview took place last week at the Sydney Opera House in Australia. Rio Tinto designated the top five diamonds of the tender as “heroes” and gave the stones elegant names to ensure their rightful place among the world’s most important diamonds. The names were inspired by the world of ballet in recognition of Argyle Pink Diamonds' partnership with The Australian Ballet. The 2015 Tender, known as the “Connoisseur’s Collection,” comprises 65 diamonds weighing a total of 44.14 carats. 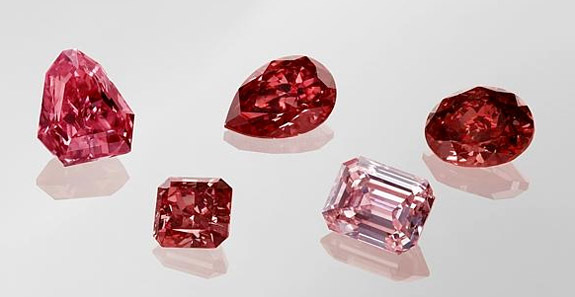 The diamonds, which were sourced at Rio Tinto’s Argyle Mine in Western Australia, represent the company’s best red and pink gems from its yearly production. 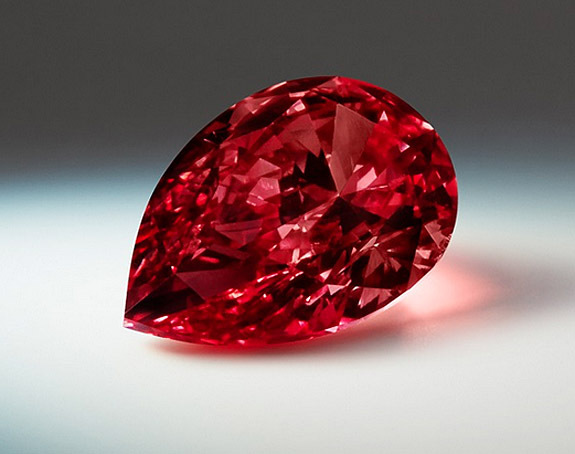 Fancy red diamonds are so rare that the Tender typically releases only four, or so, per year. The finest quality fancy red diamonds can easily sell for $1 million or more per carat. Argyle Prima™ — A 1.20-carat fancy red pear-shaped diamond coveted for its unique combination of size, shape, color and clarity. Argyle Aurora™ — A 1.47-carat fancy red oval-shaped diamond, named in honor of Princess Aurora from The Sleeping Beauty. Argyle Allegro™ — A 0.79-carat fancy red radiant-shaped diamond, named after the brisk and lively ballet movement and reminiscent of the red color dancing within this diamond. Argyle Spectre™ — A 1.93-carat fancy vivid purplish pink shield-shaped diamond. The vibrant pink color and strong shape of this diamond is inspired by the ballet Le Spectre de la rose (The Spirit of the Rose). Argyle Élevé™ — A 1.44-carat fancy intense pink emerald-shaped diamond, inspired by the ballet movement of rising high without bending, and reflecting of the perfect long lines and elegance of the emerald shape. The 2015 Argyle Pink Diamonds Tender will have viewings in Sydney, Hong Kong, New York and Perth, with bids closing on October 21, 2015. Images courtesy of Rio Tinto. July's Birthstone: Did You Know That One of the World’s Most Famous Rubies — The Timur — Is Not a Ruby at All? 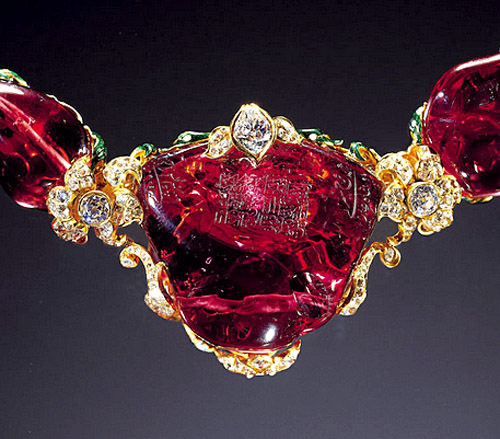 In honor of July’s official birthstone, we’d like to share the bizarre story of the "Timur Ruby," one of the world’s largest and most historic “rubies.” We use the word ruby in quotes, because the massive unfaceted 352.5-carat gem, which resides among the British Crown Jewels, was exposed in 1851 as a red spinel. Oops. The Timur Ruby gets its name from the greatest conqueror of the 14th century. 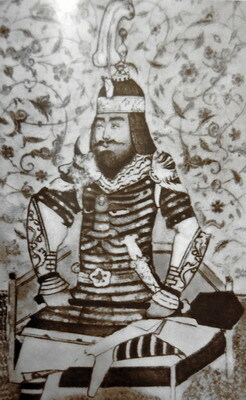 Hailing from what is now Uzbekistan, Timur’s military conquests were vast, spanning from Mongolia in the east and the Mediterranean in the west, to India in the south and Russia in the north. After successfully capturing Delhi in 1398, Timur left India six months later weighed down with a bounty of jewelry and gemstones. One of those stones was the Timur Ruby. The unfaceted stone has a semi-polished flat face that is inscribed in Arabic script with the names of four Mughal emperors and two Persian rulers who possessed the stone. These included emperors Jahangir, Shah Jahan, Aurangzeb and Farrukhsiyar, and the rulers Nadir Shah and Ahmad Shah. The inscriptions are dated between 1612 and 1771. In 1849, when the British East India Company took over the Punjab region (which is now eastern Pakistan and northern India), it also took possession of the Timur Ruby and the 186-carat Koh-i-Noor diamond from ruler Ranjit Singh. Later that same year, advancements in gemology and mineralogy led to the determination that the “largest ruby in the world” was just a big spinel. 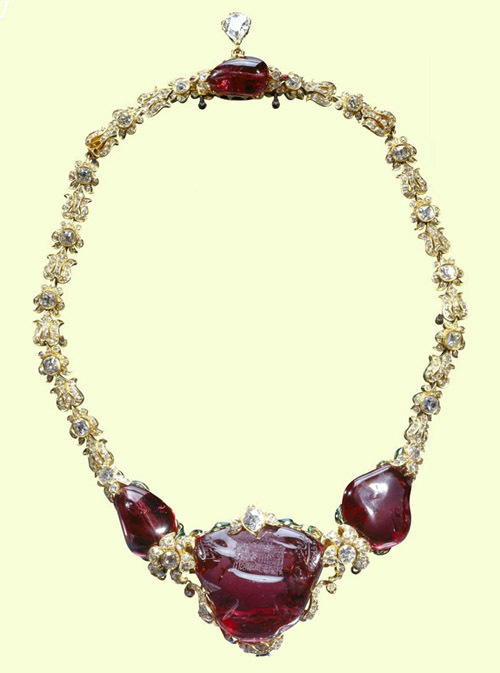 Nevertheless, Garrards set the Timur Ruby in an Oriental-inspired necklace in April 1853. 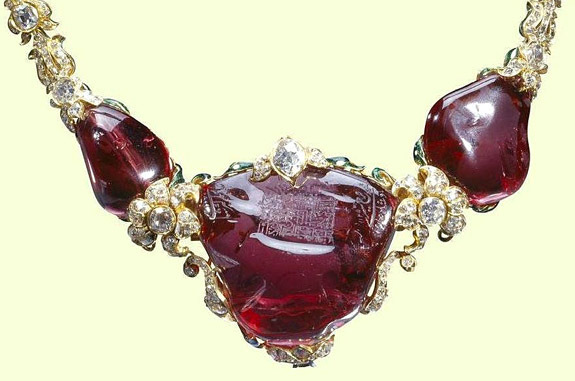 Two months later, the jeweler adjusted the necklace to allow the Timur Ruby to be detached for use as a brooch and to alternate with the recently re-cut Koh-i-Noor diamond. Today, the Timur Riby resides among the priceless British Crown Jewels, but has never been worn by a British Royal. 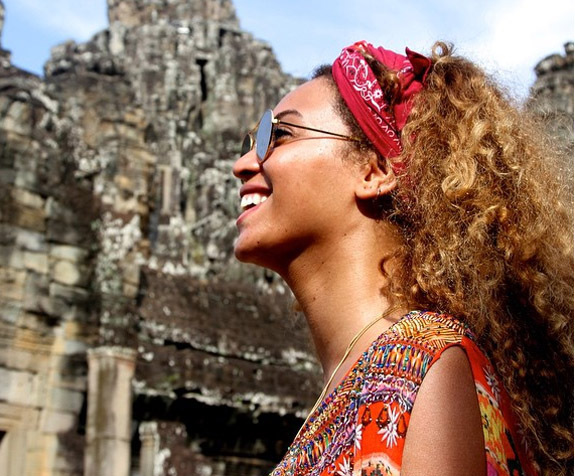 Some speculate that members of the monarchy were hesitant to wear the necklace, for fear of backlash from critics, who see the piece as historically Indian. Gemologists know now that it’s virtually impossible for a ruby to be 350-plus carats. They understand that chromium atoms incorporated in a ruby’s aluminum oxide crystal give the gem its rich, red color. They also acknowledge that the chromium so vital to the ruby’s beauty is also responsible for causing fissures in the crystal, making rubies larger than 3 carats in size extremely rare and very valuable. Due to this rarity, rubies of good color and fine clarity often achieve higher prices per carat than diamonds of the same size. Images: The Royal Collection; Pinterest; WikiCommons public domain. Actress Blake Lively dished to British Vogue why her light pink, 12-carat diamond engagement ring is her most treasured possession. 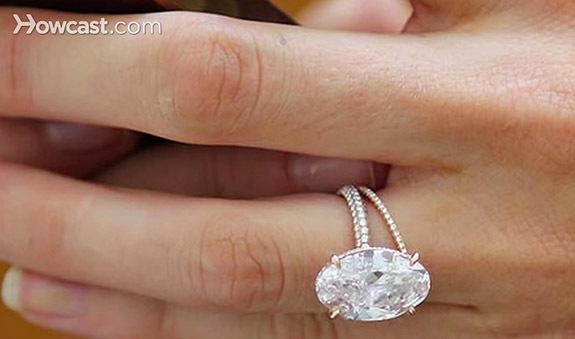 And, no, it’s not because the ring is said to be worth $2 million. Lively, who rose to fame in The CW's Gossip Girl and currently stars in the romantic epic, The Age of Adaline, told the magazine that the oval-cut, flawless diamond given to her more than three years ago by fellow actor and now-husband Ryan Reynolds still makes her swoon. "My most treasured possession is my engagement ring made by my dear friend Lorraine Schwartz, because of the love and meaning it symbolizes,” she said. “I didn't have any hand in its design — I married a gentleman." Lively’s gentleman clearly has excellent taste in jewelry and a flair for design. It was reported in 2012 that Reynolds and Schwartz worked together to pick the perfect pink stone and then design a custom setting in rose gold and pavé diamonds with a nod to Deco. Lively also wears a matching rose gold wedding band accented by a series of delicate diamonds. The couple met in June 2011 on the set of Green Lantern. He was the masked and muscular title character and she was his beautiful love interest, Carol Ferris. In quick succession, the real-life couple fell in love, got engaged and wed on September 9, 2012. In her new role as Adaline Bowman in The Age of Adaline, Lively plays a woman, who — as the result of a near-death experience in frigid waters, and being jolted back to life by a lightning strike — is able to remain 29 years old forever. The film was released on April 24 to critical acclaim. 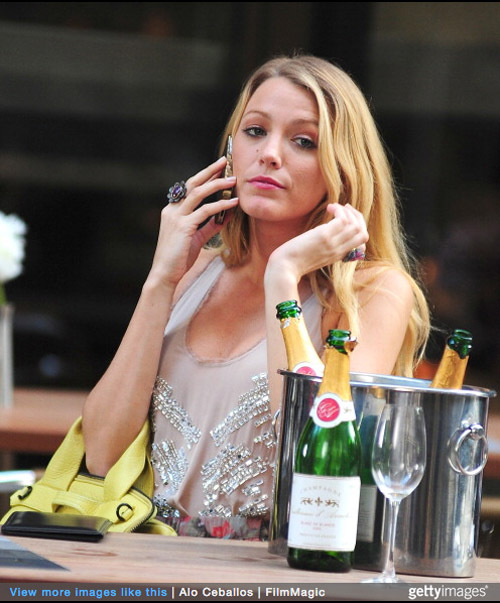 Images: Ring via YouTube.com; Lively on Gossip Girl set via Getty Images; Publicity shot from Green Lantern. A Colorado woman unearthed a super-rare find last Friday while visiting the Crater of Diamonds State Park in Murfreesboro, Ark. — a gleaming, icicle-shaped 8.52-carat white diamond. Bobbie Oskarson of Longmont, Colo., found the unusual-shaped stone – about half the size of a quarter and the thickness of a pencil – while digging in the southwest corner of the “Pig Pen,” a muddy search field covering 37½ acres. 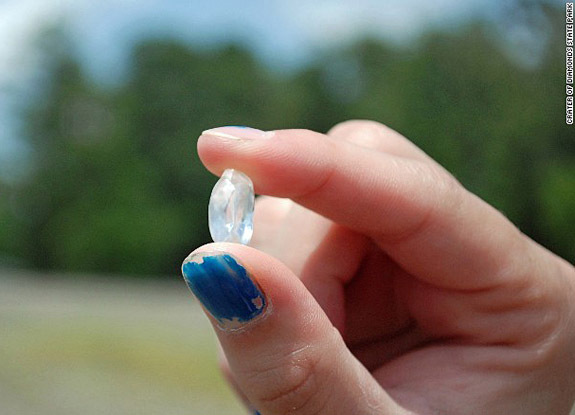 It was first thought to be a quartz crystal, but park staffers, who help visitors identify and register diamonds, confirmed its authenticity. Crater of Diamonds, one of the world's only diamond-producing sites that is open to the public, welcomes visitors to hunt for gems and maintains a "finders keepers" policy. Park representative Waymon Cox told CNN that Oskarson's gem is the fifth-largest diamond found since the park was established in 1972. So far this year, 227 diamonds have been registered. 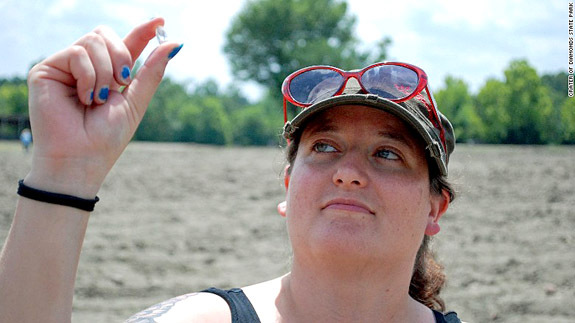 Diamond discoveries at the park have been brisk this year, mainly due to above-normal rainfall. "Rain, plus the regular plowing of the search field by our maintenance staff, increases visitors' chances of finding diamonds in the search area," Cox said. The park does not offer valuation on gems, but does offer the history of some previous rare finds. 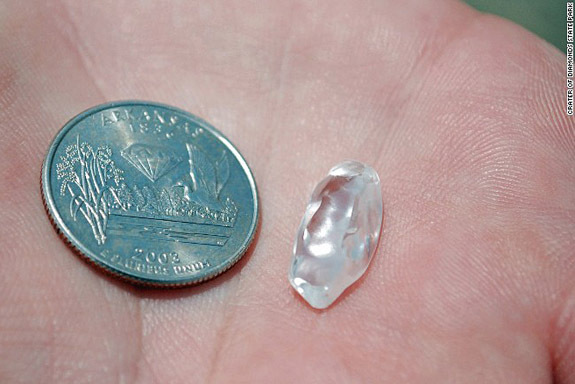 The largest rough diamond ever discovered at Crater of Diamonds (and the largest ever found in the United States) is the Uncle Sam Diamond, weighing in at a whopping 40.23 carats. Found in 1924, the Uncle Sam Diamond was faceted twice into a 12.42-carat gem that sold for $150,000 in 1971. Oskarson and boyfriend Travis Dillon had found the park on a highway map while visiting nearby Hot Springs, and decided on a whim to visit. It turned out to be their lucky day. Oskarson named her precious find the “Esperanza Diamond” – her niece's name and also the Spanish word for "hope."